As someone traveling this “Real Food” journey, I do try to incorporate more nutrient dense foods into my family's diet. However, I am also happily learning how to turn a delicious sounding standard baked good recipe into a nourishing soaked flour or sourdough treat. In years past, I have been more of a recipe follower and less of a recipe trail blazer. I am quick to admit that all of this tweaking is quite freeing… and addicting! Enjoy the latest experiment… and success! 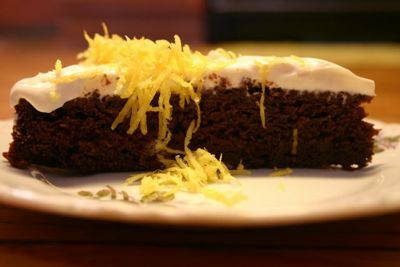 Here is a very delicious and easy, soaked, whole-grain chocolate cake. It does not require all of the squooshing as in my recent muffin recipe! The original recipe made this torte as a double decker with filling in the middle and on top. We found a sliver of single layer to be just enough. I cut the second round as brownies and saved a jar of the filling to be used as a dollop on top if I so desired. My boys (all of us, really) enjoyed them equally as well plain. This recipe is adapted from The Enchanted Broccoli Forest by Mollie Katzen. *These are directions to make your own yogurt cheese, if you want to do this instead of using another mild, creamy cheese that's on hand. The night before I made the Chocolate Torte, I took about 3 cups of my homemade yogurt and strained it in my fridge. I use jelly bags for my strainers, and they work wonderfully. As you can see, I tie them with their own draw strings to the shelves of my fridge above a bowl. In the morning, I can easily remove the yogurt cheese from the bag and place it into a container for use as sour cream, cream cheese, ice cream, frosting… The whey can then be poured into a glass jar to be used for soaking and fermenting. In a medium size bowl, stir together your 2/3 cup yogurt plus 1/2 cup of milk, fermented dairy, or coconut milk. Add 2 cups of whole grain flour. Stir well to combine. Cover and set aside for 8 to 24 hours. When ready to complete your torte, preheat the oven to 350 degrees. 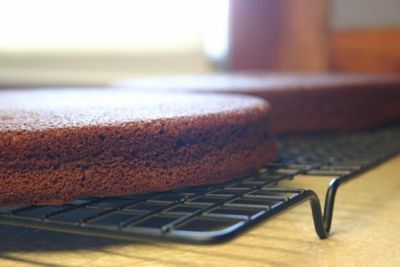 Place an oven rack on the middle shelf, and butter (2) 9-inch round cake pans. I am sure other shapes and sizes would work just as well; just adjust baking times. In a small bowl, combine melted butter or coconut oil, honey, eggs, cocoa, vanilla, baking soda, and salt. Whisk. Whisk. Whisk. Pour this mixture onto your soaking dough. Using a hand held beater, mixer, or a wooden spoon, mix until smooth. I used the beater and was thrilled with the results. Pour batter into your prepared pans. Bake for 20 to 30 minutes or until a toothpick comes out clean. Allow to cool in pans for 10 minutes or so before turning them onto a cooling rack. Oh, delicious. While cakes are cooling, prepare your yogurt cheese topping. 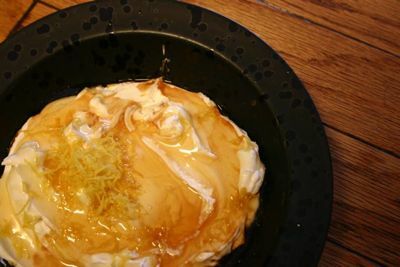 Combine yogurt cheese, vanilla, zest, and honey in a bowl. Stir to combine. Taste. Oh, mercy. So good! Put in fridge until your torte is cool and ready to top. Frost Your Torte And Enjoy! I frosted one 9-inch round, and the leftovers kept beautifully in the fridge in a sealed container. The other 9-inch round I cut into brownies and left plain. A bit less messy, for my boys to enjoy. I also kept these in the fridge in a sealed container. If unfrosted, these will freeze very well. This looks so good! I love the idea of making yogurt cheese for frosting. What a wonderful idea! .-= Melodie´s last blog post… I Have The Urge To Spank But I Choose Not To =-. This is a great chocolate torte. A healthier version with whole ingredients is really fantastic. 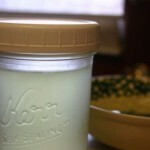 I started making my own yogurt cheese too and it’s a great alternative to boxed cream cheese. Thanks for the recipe. Oh my…..this looks yummy! My yogurt cheese always turns out too tart (except for the first time I made it) Is it the yogurt I’m using? I buy organic whole milk yogurt from Trader Joes and a couple of times I’ve tried one from Henrys. .-= Jana @ The Summer House´s last blog post… Enrich Moisturizing Face Lotion =-. Jana – Have you dripped it in the fridge? It would be especially not tart if dripped in the refrigerator. This looks delicious! I’ve developed a major sweet tooth the last few months of my pregnancy and it is really hard to come up with foods that are healthy and sweet. I can’t wait to try it. oh….yes. Thank you-that’s it. I will drip it in the fridge 🙂 Thanks a bunch. I’ll try it! The yogurt cheese sounds a little advanced for me, but I’ve been meaning to make Wardee’s frosting, so I’ll try it with this cake. Maybe with some orange zest mixed in. Keep the recipes coming, Erin! How about a main dish? Jana- i agree with Wardee… dripping it in the fridge prevents it from turning too tart. if the yogurt has a tartness in the first place, the honey, vanilla, and zest compliment it nicely. Rebecca- you have a special weekend ahead of you! 🙂 i’d love to hear if the torte adds to the sweetness of your celebration! I will definitely be giving this a try. It sounds (and looks) so wonderful! Seriously, I’m thinking of starting some flour soaking tonight, and calling in sick to work tomorrow to make this. I have been having some serious chocolate cravings lately, and this will surely hit the spot. Tried out the chocolate cake and just dusted it with icing sugar. It turned out great and is a keeper to go into my healthy food binder. Ceitllyn, so glad to hear that you enjoyed the dessert! I made another batch the other night, and we served it with a cinnamon whipped cream. Delish! I made this torte for a fun game night a few months ago, and my brother and I loved it. At his request, I’m making it again for his birthday. Yummy! I made this today! So, so good. I added some cinnamon and cumin to make it “Aztec” or “Mexican” style and ate it just as brownies. Very satisfying and spicy 🙂 Thank you so much for the recipe! Hi Emma! Thanks so much for your comment! Your variation sounds delish. I may have to give it a try. 🙂 Happy Easter! I LOVE Erin’s recipes! This one looks great. I may have to give it a gluten free spin for my allergic daughter 🙂 Thinking a combo of buckwheat, millet and almond flour would be good for this. This looks so good. Thanks for including the instructions for making yogurt cheese. 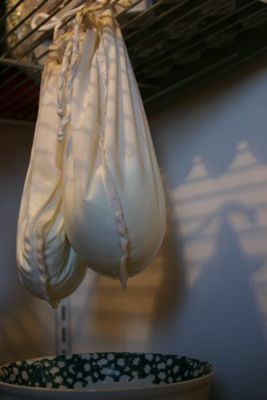 I love to let my yogurt hang for 24 hours to make it very thick and probiotic. The whey leftover has so many uses. I have a question. Why is this called a “torte”. I’ve always thought that what we normally call a “torte” was a cake-like yummy thing made with no flour; just finely chopped nuts. Have I been wrong all this time? What distinguishes a torte from a cake?